Caption: Parents, educators and school board members gather before heading to the Legislative Office Building for meetings with lawmakers. Photo by El-Wise Noisette. With touching personal stories and pleas for more funding, students, parents and educators put a face on the many ways BOCES programs are changing — and saving — kids’ lives. There was Eastern Suffolk BOCES student Brianna Coccia, who said her Career and Technical Education program has given her a huge head start on her audio production career — and a leg up on the competition for landing a community theater internship and auditioning for entry into SUNY Purchase. TWITTER MOMENTS: Your tweets and photos from BOCES Advocacy Day. TAKE ACTION: Urge your state reps to support more funding for New York's CTE programs. Sitting next to her was culinary student Hannah Uhlmann, who told Assemblyman Andrew Garbarino that, while she wasn’t the strongest academic student, the BOCES program has dramatically boosted her confidence and launched her into a promising career that she loves. Southern Westchester BOCES TA's Kevin McCallister and Matt Robertson encouraged Toby Ruiz and her daughter Raquel to tell their personal story to lawmakers. "BOCES was my miracle," Raquel said. Photo by El-Wise Noisette. Raquel Ruiz, joined by her mother, told lawmakers the Southern Westchester BOCES program probably saved her life. When mental health issues made it difficult for her to go to school in eighth grade, Raquel said her placement in a specialized setting at Irvington High School provided the crucial support she needed to turn her life around. Without BOCES, Ruiz told lawmakers she’s not sure her daughter would be finishing high school. Now they’re planning for college. Brianna, Hannah and Raquel were just three of the many BOCES students who took part in a statewide lobby day on Wednesday. Along with educators and administrators, they came to make the case for more funding and other legislative action so that programs around the state can be enhanced and expanded. “Your personal stories are what lawmakers will remember when they’re making budget decisions,” said NYSUT President Andy Pallotta. He noted BOCES lobby day is different from most because it includes students, educators, administrators and board members all advocating together, side by side. Franklin-Essex-Hamilton BOCES teacher Tracy Edwards' students took that message to heart. They explained to lawmakers how their New Visions Government and Law class gives them the chance to work on unique hands-on projects. For example, students are currently working on a local history project where they're trying to identify the proper placement of nine history marker signs discovered in the basement of the county historical society. "It's been a fascinating project," Edwards said. "They've been digging through state archives... we learned how 73 men mortgaged their farms to supply funds for a school in 1806." Aside from telling their personal stories, advocates strongly made the case for more general education funding so that districts can afford to send students to the regional programs. Monroe 1 BOCES activists meet with Assemblyman Harry Bronson, D-Rochester. Photo by El-Wise Noisette. Eastern Suffolk BOCES CTE teacher Lisa Mongiello said budgetary pressures are causing too many districts to limit students to just one year of CTE education. This means either they have to pay out of their own pocket to remain in the programs or wait until senior year. David Shalke, an automotive and technology CTE teacher at Monroe 1 BOCES automotive and technology program, urged state lawmakers to change the funding methodology so that more districts will send their students to BOCES programs. Under a complex formula that hasn’t been updated since 1990, only the first $30,000 of a BOCES CTE employee’s salary qualifies for state aid, meaning that the rest of the salary must be covered by cash-strapped school districts. “Raising the aidable salary amount would be a key piece to encourage more school districts to use BOCES,” Shalke said. 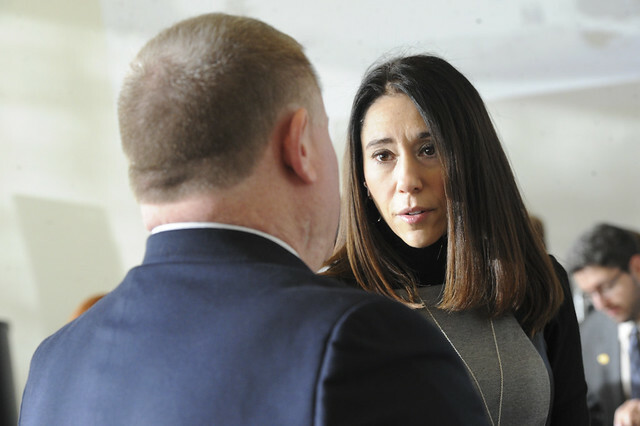 With school safety issues front and center since the Florida shooting, Monroe 1 BOCES United Employees Co-President Andy Jordan made an impassioned plea for lawmakers to expand state aid for school safety equipment to include BOCES. “Our security needs are growing, yet we weren’t included in legislation that provides building aid to school districts for metal detectors and other security measures,” Jordan said. legislation providing preschool special education programs with a desperately needed cost-of-living adjustment. A 21st Century economy demands a 21st Century workforce. Visit the MAC to urge your reps to support New York's Career and Technical Education programs.